This article is published in collaboration with Washington Post. We’re used to thinking that the jobs that are most likely to be taken over by automation are low-skilled ones: clerks, lowly paper pushers, assembly line workers. In contrast, those on the very high end of the wage scale — doctors, CEOs and hedge fund managers — seem like they will be comfortably insulated from the robot revolution. But new research from McKinsey & Company, a consultancy, shows that that isn’t quite right. While there is a connection between a job’s skill level and the likelihood it will be automated, there are a lot of jobs that don’t fit that pattern. One example: CEOs, whose jobs will be more affected by automation than landscapers, the researchers say. The researchers argue that the way we usually talk about robots displacing workers is misleading. We typically try to identify the jobs that will disappear because of automation. In the near term, however, very few occupations will be automated away entirely. McKinsey estimates that, with the technology available today, fewer than 5 percent of occupations could be entirely turned over to robots. The more accurate way to think about this, they say, is not in terms of entire jobs, but in terms of activities. Few of us will actually be replaced by a robot. But there are tons of workers who will have part of their jobs taken away by automation. That category includes not only low-paid workers, but the most highly paid jobs in the U.S. — including doctors, hedge fund managers and CEOs. According to McKinsey, as much as 45 percent of the activities that people are paid to perform today could be automated by adapting current technologies — representing about $2 trillion in annual wages. Once robots can accurately process and understand natural languages, an additional 13 percent of work activities in the U.S. could be automated, they say. For about 60 percent of jobs in the U.S., nearly a third or more of their activities could be automated, they estimate. What would that mean for individual workers? Mortgage-loan officers might spend more time advising clients, processing loans and reviewing exceptions, rather than doing inspections and filling out rote paperwork. Emergency room doctors might spend more time on the most serious or unusual cases, while robots do the triage and diagnose routine illnesses. For CEOs, activities like analyzing reports and data, preparing staff assignments, and reviewing status reports could be automated given current technology. These tasks account for about one-fifth of a CEO’s time, the researchers estimate. 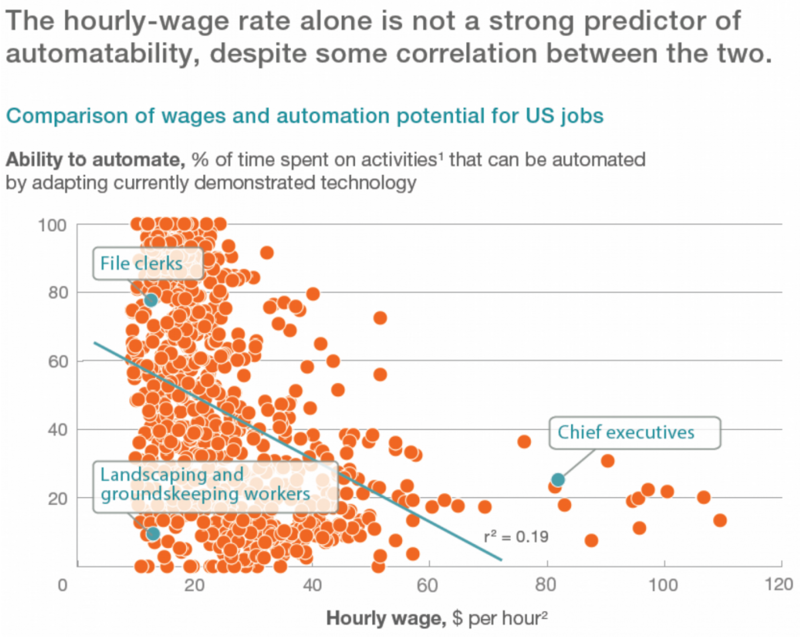 The chart below from McKinsey shows the relationship between wages and the potential for a job to be automated. You can see that most highly skilled jobs are hard to automate, but low-skilled jobs are actually all over the map. “The common sense way to describe it is that there is a relationship between wages and automatability, but it is not very predictive,” says Michael Chui, one of the authors. Many low-skilled workers will see a significant portion of their jobs automated, too — for example, much of the jobs of file clerks could be done by robots. But other low-skilled workers, including home health aides, landscapers and maintenance workers, are actually pretty resilient to automation. This process of automating parts of jobs is likely to increase our productivity overall, resulting in more and better products, which are more interesting and valuable to consumers, says Chui. But whether the process will end up increasing workers wages and leisure time, or push them out of the job, is less certain. On the plus side, Chui points out that we have been automating work for hundreds of years, and we’ve always been able to create new jobs. A century ago, most of our ancestors were farmers. Today, it’s not as if we have 80 percent unemployment. But are we now automating jobs faster than we can create them? Only time will tell. Image: A humanoid robot serves tea to a visitor. REUTERS/Siphiwe Sibeko.